Concrete foundations are all that is left of the old factory. Selma, southwest Oregon. This is an unusual story for a brick factory because descriptions of this enterprise made it appear that far more bricks crumbled than were manufactured. This may be disconcerting news for residents of Illinois Valley where most of the bricks from this factory were used. The factory operated during the 1940s a few yards from Highway 199 near Hays Hill, about 16 miles from Grants Pass. The owner was Frank MacFarlane, a brick contractor who was credited with building nearly all the brick buildings in Grants Pass (1). The plant was reported to be capable of manufacturing 15,000 bricks a day. 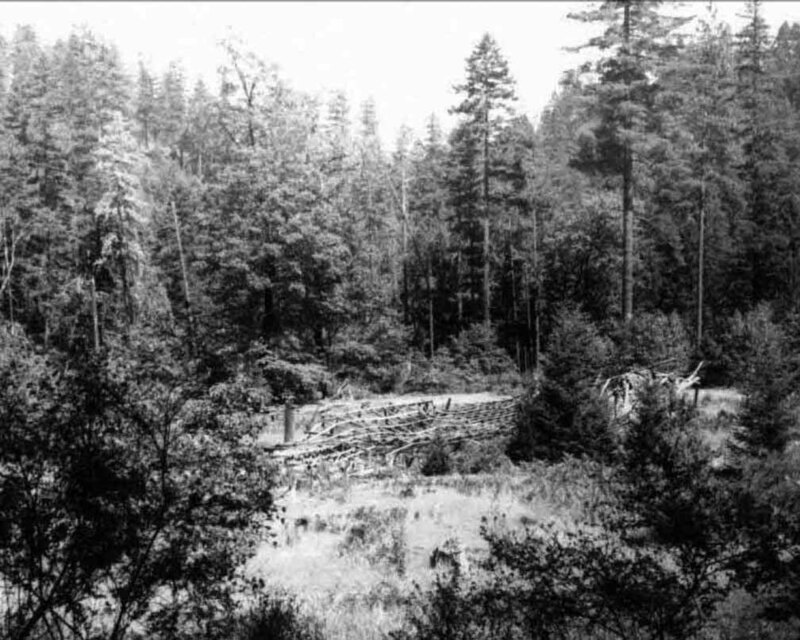 There were great expectations for the operation because competitive grades of brick clay were in short supply in southern Oregon and most clay deposits suitable for brick manufacturing had been worked out many years ago (4). MacFarlane projected that once the brick became known that he would need to add a second shift and expected he could produce 25,000 bricks a day. Newspaper articles claimed his product would be well known by next year (1941) as the best brick on the coast (2). The original claims crossed the Redwood Highway but most of the work was done near the site where the factory was established west of the road. About three acres of land had been cleared for the factory with the main source of clay coming from a hill behind the buildings. A picture of the factory site taken in 1965 shows the remains of a long building lying on the ground (4). This was probably the drying building. The factory included a small power plant using a gas motor to generate electricity, a disintegrator to break up the clay, a brick machine, pug mill (mixer), and cutter for making standard bricks and 12×12 inch bricks. Buildings included a 100×20 foot drying shed, machine shop, power house, and a kiln that was 12 feet high, 15 feet wide, and 20 feet long with three small fire boxes running the length of the kiln. The kiln was heated by using wood from the surrounding forest. Water was provided from a 40 ft. dug well. Despite the promising prospects of the operation, it quickly became apparent that MacFarlane did not know anything about brick manufacturing. His kiln did not provide a uniform source of heat so bricks were frequently cooked on one side and uncooked on the other. A geologist from the Oregon Department of Geology and Mineral Industries (DOGAMI) who visited the site in 1941 estimated that only one percent of the bricks being fired in the kiln were usable. The access road into the factory site is at the end of a guard rail about 500 feet north of the Highway 199 intersection with Onion Mountain Road. Foundations made of concrete and excavations for clay can be found to the left. A flat area can be found to the right of the foundations where fragments of brick can be found. The geologist also noted that the clay coming from his claim was not the best for brick making. The clay was decomposed shale that still had considerable amounts of shale in it. This was crushed and put through a brick molder, using oil as a lubricant. Apparently, the unfired brick didn’t stand up even during drying. Several years after the factory had become inactive, the Bureau of Mines at Albany did a mineral examination of the claims and classified the samples as a “soil” with a minor amount of halloysite clay (4). No substantial market was created by Macfarlane in the 1940’s when he manufactured brick and tile and used most of it in his own masonry jobs, most of which were chimneys and fireplaces in the Illinois Valley area (4). A geologist from DOGAMI visited the site in 1947 and reported that MacFarlane was still operating the factory but only for the manufacture of brick used in his own masonry work. The geologist noted that the problem with uneven firing of bricks persisted. By 1965, the site had been abandoned and the buildings had fallen in disrepair. In 1963, the claims were sold to a Paul Gustlin who intended to use the mining patent to build a motel at the site. A report done in 1965 found the claims to be invalid for patenting and were subsequently abandoned. 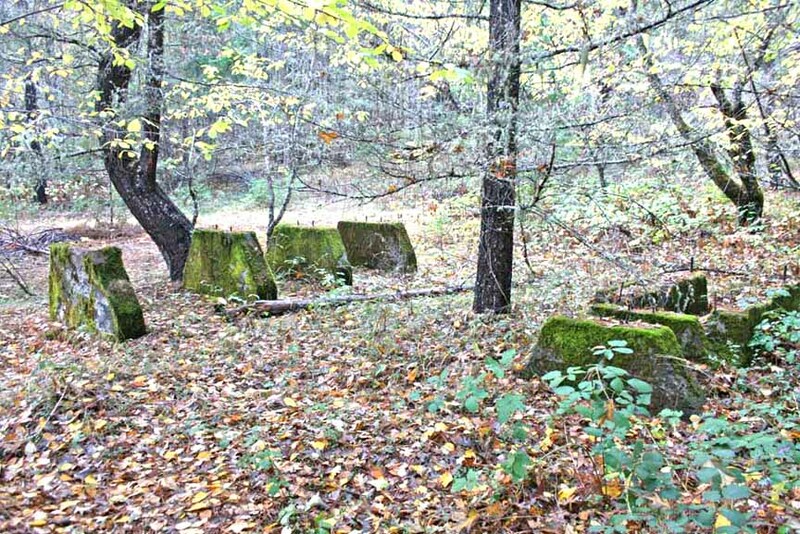 The site of the brick factory is located about 300 feet from Highway 199 and can be reached by following a dirt road to an open area where a vehicle can easily turn around. The location of the plant is marked by concrete foundations, which can be found in the wooded area immediately west of the turnaround area. There is a small hill behind this where excavation has been done to mine the clay. One of these excavations goes directly into the slope and above this is another that cuts across the slope. If you walk a few feet to the north of the foundations, there is a flat area where some brick fragments can be found. 1) Illinois Valley News, May 9, 1940. Brick and tile plant brings new industry. 2) Illinois Valley News, September 12, 1940. New brick plant starts operation. 3) Macfarlane Brick Plant. Oregon Metal Mines Handbook, Bulletin 14-C, Vol. II, Section 1 (Josephine County). Oregon Department of Geology and Mineral Industries (1952), p 135-136.